Your owner definitely has a lot of confidence! We're finally here! After 6 months of work, 16 teams have earned the right to battle for the throne. The Wizards rebounded from a sluggish start to claim the #6 seed in the East and will take on Dwight Howard and the Orlando Magic in the first round. 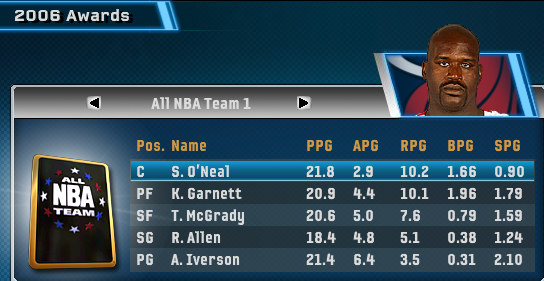 Fueled by All-Star PG Gilbert Arenas, Washington's high-powered offense leads the NBA in pace and PPG. You might call it run-and-gun, but Coach Eddie Jordan preaches run-and-execute. Indeed, the Wizards also lead the league in FG% and clean up their misses (2nd in ORPG). However, their fast pace introduces some risk as they lead the league in TOPG. Defensively, the Wizards are far more conservative. 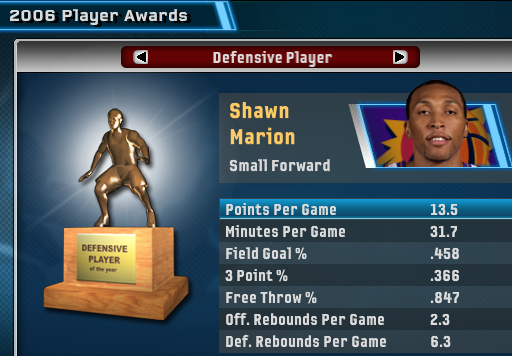 They don't foul (bottom 3), but they're dead last in defensive rebounding and blocks. That could spell trouble against Dwight Howard, one of the league's best rebounding and scoring big men. 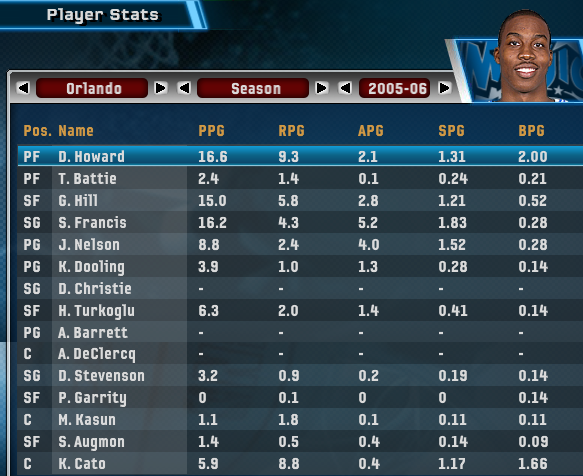 Orlando is an average offensive team on paper but features 3 players averaging 15+ PPG. 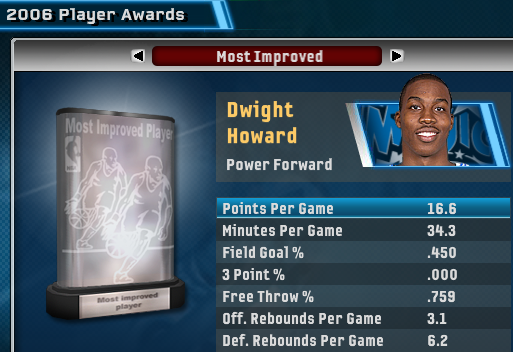 Dwight Howard, Grant Hill, and Steve Francis are all capable of going off on any given night, especially in the playoffs. The Magic pride themselves on defense, ranking 3rd in blocks and 10th in steals. Howard's rim protection alone will be a significant issue for Washington when the 3PT shot isn't falling - an all too familiar scenario. 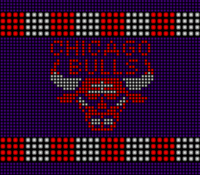 So there you have it - a lightning-fast, efficient offense meets a methodical, stingy defense. Do Jamison and Agent Zero have enough left in the tank to topple the favored Magic? The Wizards beat them once on the road. Only time will tell if they can pull it off 4 more times. A lot of fun matchups going on there: Houston and Denver, run-and-gun Phoenix and Seattle, LeBron vs. VC (who knew in 2018 that would mean LeBron versus virtual currency )... prime Hill and Francis were a bit before my time, so it's hard for me to gauge what this Orlando team is like; they don't seem like that much of a threat. I don't think an upset is out of the question. Agent Zero was a man on a mission tonight. Right out of the gate, Arenas single-handedly controlled the tempo on both ends of the court. He rattled the Orlando backcourt with 5 steals and orchestrated the offense with 41 points and 8 assists - his second 40+ point performance this season. Washington maintained a 5-10 point lead for most of the game and kept the Amway Arena crowd in their seats. Jamison scored 17 points, and Haywood added a double-double with 10 points, 11 rebounds. I wanted to make a statement tonight. A lot of people are probably looking at the seeding, matchups, stats, and all that, but our mindset is to go win 4 games and leave it all on the court. For me, it's all about defense, getting your team involved, and attacking the basket. When you're doing those things, the rest of your game comes naturally. It was obviously huge for us to go out and win game 1 in Orlando. I wanted to throw some zone at them early to force them out of their comfort zone and into some outside shots. We had success with that, and Arenas was obviously phenomenal on both ends. When you have a leader like that, a lot of things are going to go right. Live 06 apparently doesn't record box scores for playoff games. I'll either have to grab those right after the game ends or just stick with highlighted stats in the summaries. Last edited by Breems on Wed Oct 17, 2018 3:46 pm, edited 1 time in total. Great way to tip off the postseason! Box scores are nice, but Kenny's Nuggets kind of taught me we can live without them (and that also gives people incentive to actually read the recap), so it's all good. cavs4872 wrote: Box scores are nice, but Kenny's Nuggets kind of taught me we can live without them (and that also gives people incentive to actually read the recap), so it's all good. Agreed. I save them mainly for myself so I can eventually look back on trends, progression, etc. I may just do the playoffs without them to save on time, though. 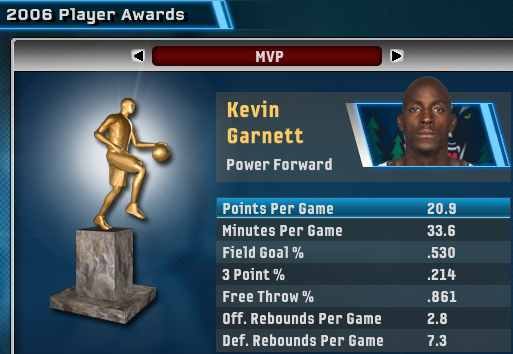 I actually experimented with using the Playoff Tree file from NBA Live 07 to access boxscores in NBA Live 06. From memory, it either didn't work, or it worked in so much as being able to bring up the boxscores but caused some other problem like not being able to navigate out of the menu. Either way, it sadly wasn't a viable solution. If it ain't broke, don't fix it. The Wizards had a solid gameplan for the Magic in game 1, and it was just as efficient - if not more so - in game 2. Q1 was evenly played, but the Wizards' fast-pace began to outgun the Magic in Q2. Coming out of the half, the Wizards blew the game open and led by 20+ points for most of Q3. Arenas fueled the offense (18 points, 5 rebounds, 4 assists), Jamison was dominant down low (22 points), and Jaric was on point from the perimeter (16 points, 4/5 3PT). Backup PF Etan Thomas scored a season-high 11 points off the bench. The Magic mounted a comeback late in Q4 behind Dwight Howard (24 points, 10 rebounds), but it was too little too late. Steve Francis scored 20 for the Magic, and Grant Hill and Jameer Nelson each added 14. Orlando has to feel uneasy after squandering their home court advantage. Eddie Jones' 2-3 zone clearly has Orlando's offense out of whack, and they can't stop Washington's steamroller offense. If they don't find answers soon, the Wizards could coast to a surprise sweep. Young Dwight had so much potential, he could dunk through backboards! Solid win to put you in the driver's seat heading back to Washington. I'd be a little surprised. Both NBA Live 19 and NBA 2K19 have some occasional clipping issues, but for the most part, stuff like that doesn't really happen. Not to that extent, anyway. Haven't had much time to play recently. My daughter is napping less and eating solids now, so that cuts into my evening. After this weekend, I should have more weekends at home. See you guys soon! 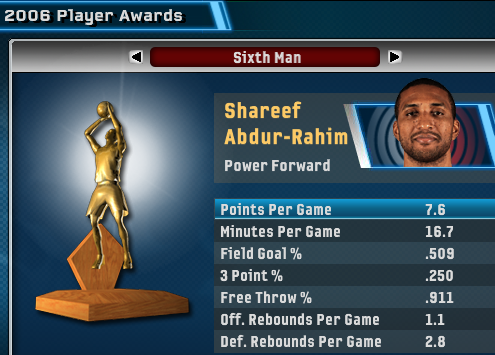 Gilbert Arenas was the only Wizard to get an award by making the All Defensive First Team. 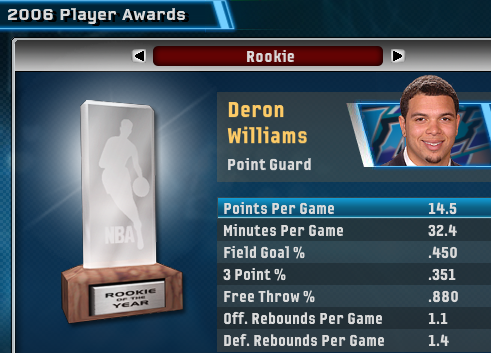 I decided to sim 2 games in this series to account for the chaos of the playoffs. We split the home trip to go up 3-1 in the series.